I'm wanting to get in to EAA and I am researching various options including either night-vision or near real-time images with a camera/computer setup. I've mainly researched the camera approach so far but now I am getting into researching the night-vision approach. prime focal-point. Effective focal length/speed can be changed by adding focal reducers/barlows to telescope. Mod3b with C-mount can be used. I've read that the Afocal approach has more glass involved but may allow for focus to be more easily achieved. Tele Vue likes the AFocal approach since they can sell you more eye-pieces. The prime focal-point approach may save a bit of money since no eye-pieces involved. In each case, I used the eyepiece FofV calculator with using an "eyepiece" FL of 26 mm and FOV of 40 degrees for the NV device. 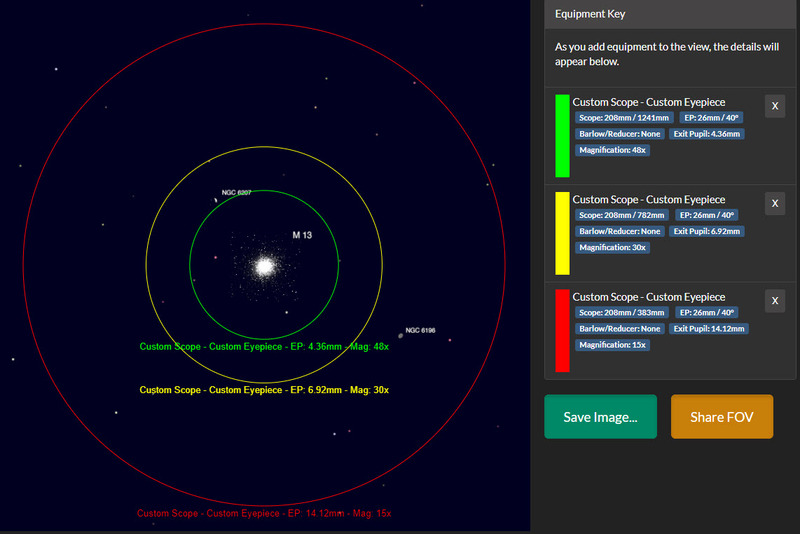 I would enter this Effective FL into the FOV calculator along with the true telescope aperture. Am I doing these FOV calculations right? I included below one large target and one medium target. Edited by jprideaux, 20 January 2019 - 05:42 PM. The way i handle the FOV calculation with afocal NV is to use standard NV FOV (27mm 40 deg eyepiece) and then just adjust the effective focal ratio of the scope in use. In the case you have above; a 8" f4 telescope...I get a FOV at prime focus at 1.3deg and 31.5x. A 55mm eyepiece give you the effect of a .5x reducer so when you use it afocally with the above setup...i get 2.5 deg and 15.8x. A 40mm eyepiece gives a .7x reducer effect. I find this method works best for me so i only have to change the reduction factor to figure FOV. I am sure someone will chime in with the mathematical formula to figure this out precisely. It looks like what you did is really close to mine so either way your good. Thanks. 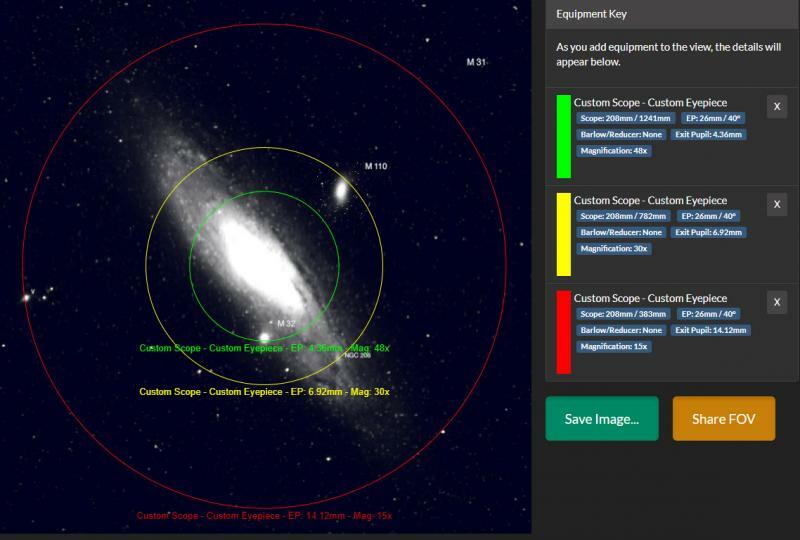 It does work out with the FofV calculator to enter the actual FL of the telescope and enter the ratio of the NV FL divided by the actual EP FL used as the reducer multiplier with entering the NV FL and FOV as the eyepiece. I agree, it’s probably better to just think of it that way. Edited by jprideaux, 20 January 2019 - 09:36 PM. This post spells out how to calculate the exact FOV. Post 18 is the quick read. Your understanding on this is pretty solid. For True Field, I just approximate it by dividing True Field at 1x (40 degrees) by the resulting magnification of the configuration. Plenty accurate for visual work. Operationally, afocal and prime focus are both means to the same end - speeding up your system, or less often getting more image scale. Scopes that focus by moving the primary can handle it. Refractors have generous focuser travel and can generally handle 0.7x reducers and sometimes 0.5x reducers (varies by travel of the model in question). Newtonians are more challenged by focus travel. Scope mods (truss tube shortening) can be expected, about 0.5" to use a 0.7x reducer. Using a 0.5x reducer one can expect about 2-2.5" of shortening. Astrographs are an exception as they are designed with backfocus in mind. Afocal does not require scope mods. In fact, the 55 Plossl may require more out-focus than you are accustomed to, which is easily handled by a $40 focuser extension tube. SIPS users may also need to use this method. Data-mine Mike Lockwood's NV posts on this forum for more information on that. Afocal downside is a formidable equipment stack hanging off your focuser. In the end, the adapters are low cost and it pays to have them on hand so you employ either method as needed.
. Afocal downside is a formidable equipment stack hanging off your focuser. Next time i'm out i am going to try the .7x reducer and 40mm TV plossl together. It should give the same .5x reduction effect with a greatly reduced stack height and weight. If you need more zoom then night vision can be barlowed and not suffer CA, since you're seeing things in green or blueish hue anyways... NVD eyepieces are like 26-27mm.